Most of the time trailers oversell a film. Not Disney’s Zootopia, which is even better and more distinctive than the trailer would have you believe. Like Who Framed Roger Rabbit, it’s a crime mystery featuring animated characters (but without the live action component), and like any number of Disney movies it’s about a main character who dreams beyond the limitations imposed by parents, society, or physical stature. It’s about a young bunny named Judy Hopps (Ginnifer Goodwin) who wants to go against her biological destiny to farm carrots like her mother and father and instead become a police officer in the big animal city of Zootopia. Disney has a deft way of introducing the basic premise and characters, then quickly getting to the start of the action. We saw it in that poignant montage in Up, and we see it here as directors Byron Howard, Rich Moore, and Jared Bush take us to an amusing (and spot-on) performance of a school play with Judy’s parents filming her sketch about the history of animals—how once animals were predators and prey before they evolved into a higher order where predators and prey could peacefully co-exist and could become anything they want. But we quickly see the clash between idealism and the kind of realism that kids today can identify with, when on the school playground a fox bully takes tickets away from a group of “prey” kids, and Judy, still in her I-wanna-be-a-police-officer uniform, tries to stop the much bigger bully. She’s feisty, but is knocked down and clawed as a reminder that she is what she is, and told by the fox that she’ll never become a police officer. 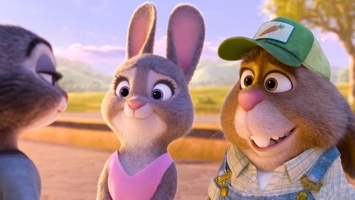 But some animals—and people—rise to the challenge, and when we fast-forward 15 years later we see Judy leaving her small-town environment and heading for Zootopia to train at the Police Academy. After rising to the top of her class Judy becomes the first bunny police officer, only to find herself going up against a good-old-boy network led by Chief Bogo (Idris Elba), in a a work environment where everyone is taller, bigger, stronger. Even the mayor is a lion (J.K. Simmons) who has an assistant who’s a sheep (Jenny Slate). So there are still subtle traces of a natural order based on survival of the fittest, which means that Judy has to become more resourceful to break her glass ceiling. Assigned the demeaning job of meter maid, she nonetheless finds a way to earn a shot at finding one of 14 missing predators in the city’s biggest investigation. 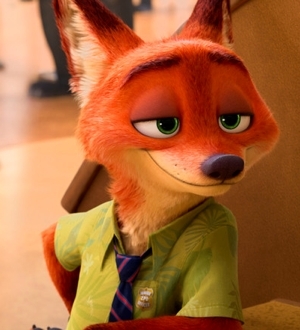 Given 48 hours, she partners with a con-artist Fox named Nick Wilde (Jason Bateman) the way that Nick Nolte did with Eddie Murphy in 48 Hours. And yes, the allusion is deliberate. When they later come across a lab operation that reminds you of Breaking Bad, in case you don’t get the visual allusion they toss out the line about “Walter and Jesse coming soon.” And what would an animated crime film be without an homage to The Godfather? It’s these kind of touches that make Disney animated films entertaining for adults as well as children. The dialogue in Zootopia is sharp, and the writers have a lot of fun playing with clichés pertaining to species like lemmings, sloths, and rabbits (“Your mom and I and your 275 brothers and sisters”). The characters have as much personality as any human, the plot is complicated but not confusing, and Disney once again does what Disney does best: creating a complete world that’s fun to visit. Fans of Shakira will like that she plays pop star Gazelle, and Nate Torrence is incredibly endearing as Officer Clawhauser. Really, though, all of the voice talents—name or no name—do a fantastic job. Add on a few positive messages for children and adolescents and you’ve got another animated classic-to-be. 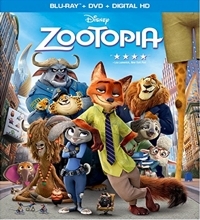 Zootopia is top-tier Disney, the kind of film that families will want to watch over and over again, so be sure to go with the Blu-ray for top-quality HD.